No running today for me. While I did entertain the idea, Susie wasn’t keen on running, and I wanted to be with her rather than going out on my own. Instead, we went for a walk around Conningbrook Lakes (it is slightly oversold as a country park!). We are getting close to our 200 mile challenge along the coast starting in a few days time, Everyone else seems to have got their packing already done, I thought I better had too. For those of you who are new to my blog, I am running 200+ miles from Hythe (Kent) to Bournemouth (Dorset) with 4 friends of mine – Michael Nowicki, Paul Commons, Keith Dean and Marek Kowalak. We ran 177 miles along the Kent Coast over 4 days last year. Our run starts on 1 April and finishes on 4 April. We will then carry on along the UK coast – covering the entire route a couple of hundred miles at a time. I’m not the most planned person, but I do like laying all of my kit out on the bed. I am a visual person, and it helps me to spot the gaps in my kit and equipment. So, here is the obligatory kit shot……. and the range of shoes I am taking with me – from left to right – for different conditions (muddier to the right) and just because it is nice to have a change of shoes on different days. Excited too that more of our friends are popping down at various points to encourage and motivate us on during the 4 days. We are all so excited!! donate some pennies through http://www.justgiving.com/hythetoIOW – we are supporting the Royal National Lifeboat Institution (seems appropriate as we are running around the coast, and they save so many lives… and don’t get any taxpayer funds). Next t-3 #runthecoast Food and Calories!!!!! 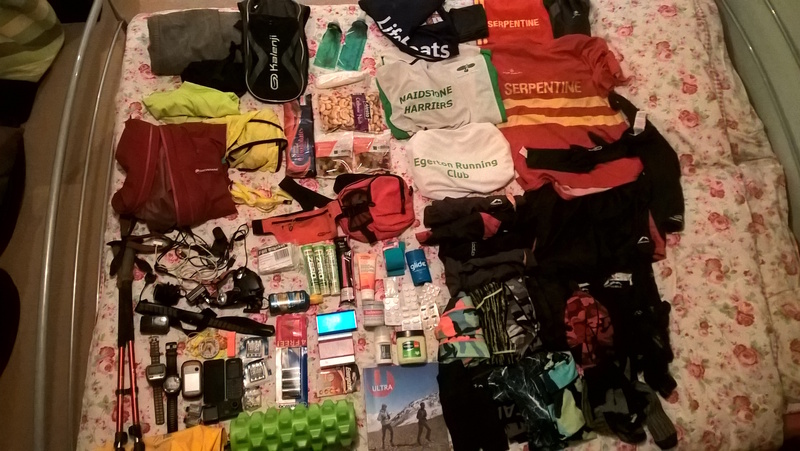 Thank you for sharing your supplies for your upcoming run with us. It’s an incredible feat, and I am looking forward to reading all about your adventure. Good luck! Thanks Jane!! We are so excited about doing this – thanks for your support.